There is an inconvenient truth about guns and elected leaders. 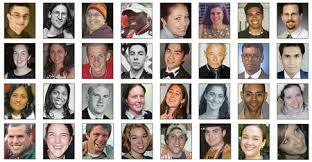 The burden of lack of common sense gun laws is borne by the victims and survivors and their families and friends. It is borne by our communities and our children. It is inconvenient to bury a loved one whose life was taken suddenly and violently from senseless gun violence. Men and Republicans. Hmm. Who is mostly in charge of the Minnesota legislature? Yup. Whether or not Brady background checks on all gun sales would stop mass shootings seems open to debate. And background checks will not, of course, stop all shootings. But a one woman polled said, “How can it hurt?” Indeed. Why we don’t at least try is the question that needs to be asked. The fact that we don’t tells us who is in control and it’s not the majority of Minnesotans. It is time for our leaders to bear the burden of lack of action and do the right thing. It’s significant to note that even rural Minnesotans want Brady background checks. The comment from one of the gun owners polled was consistent with those who don’t want background checks for fear that they can’t sell a gun to their brother without doing a background check. One thing to consider is that we have to hope that the person selling is not a domestic abuser who got his/her gun without a background check from another private seller. This is one way that guns get into the hands of those who shouldn’t have them. 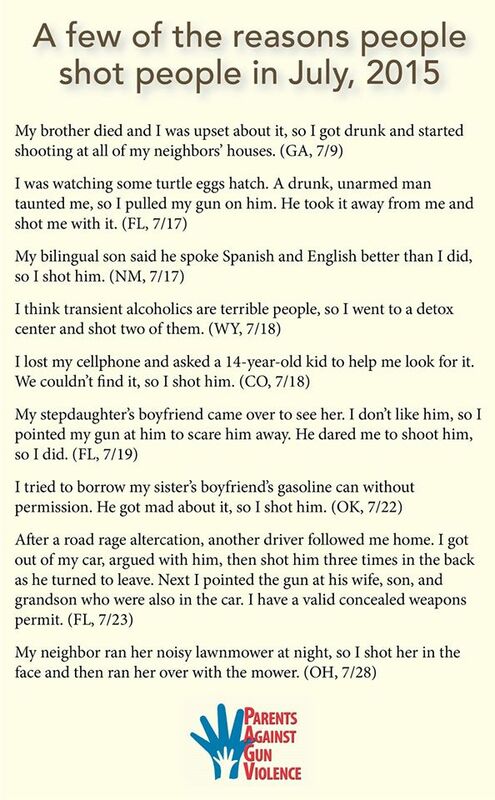 How often are relatives involved in providing guns to others? That is a question that should be asked and answered. But further, most background check laws exempt those who buy from and sell to close relatives. But let’s hope that those who do this make darned sure the relative is a responsible gun owner who doesn’t intend harm to others. So this poll is not a surprise. But it must be a surprise to our legislators that their constituents want them to do the right thing. Or is it? Many of them turn their backs on common sense and vote with the corporate gun lobby instead. I believe they understand that they could do the right thing but they are afraid to stand up to the din of the corporate gun lobbyists who park themselves in their offices. This is not acceptable any more. The gun issue is one of the main issues of the Presidential election and should be one of the main issues for down ballot races as well. We need to make it an issue. It is up to us to ask our elected officials if they will vote with the majority of their constituents and pass laws that will keep us safer from shootings. There is no reason not to vote in favor of a law that could save lives. And speaking of polls, Presidential candidate Donald Trump has claimed that his polling shows strong enough support for him that he could step outside on 5th Avenue and shoot someone and no one would care. Really Donald Trump? This kind of rhetoric fans the flames of violent solutions and the gun lobby’s mantra that guns make us all safer and that everyone should carry one. And yes, we would care if you actually shot someone on the streets of New York City even though some of your supporters in the room where you made that statement laughed. Did they laugh because they didn’t dare not? Did they laugh because they were nervous about what you just said? Did they laugh because they actually believed that you could shoot someone and get away with it because you are Donald Trump and they think you should be the leader of the free world? Just imagine this rhetoric coming from the President of the United States. The National Rifle Association’s (NRA) New York state financial disclosure forms for 2014 are now online, and like past years’ tax filings, the documents provide a rare glimpse at the organization’s inner machinery. The group’s total revenues fell from more than $347 million in 2013 to roughly $310 million. Contributing to the decline was a drop in income collected from its members. Revenue from annual dues fell from $175 million to $128 million in 2014, a drop of 27 percent. But the truth of those numbers is a matter of debate — the NRA has never allowed an outside party to authenticate its membership, and independent estimates predict a much smaller number. Circulation audits of American Rifleman and other NRA-published magazines that are sent to every member come in at around 3 million. One former board membertold the Washington Post in 1998 that when the NRA counts its size, it includes many deceased lifetime members. I have written about this before. I know people who have dropped their memberships. I know people who get cards from the NRA enrolling them in their membership. One of my friends is a lifetime member of the NRA because her father bought her a membership when she was a child. She does own a gun but she is working hard alongside gun violence prevention groups in Minnesota to pass reasonable laws. I have a friend who likes to shoot guns at a local gun club. In order to join this club, he has to also join the NRA. He does not believe in what the NRA does and supports my efforts to pass common sense gun laws. The inconvenient truth is that most Americans want their leaders to pass stronger gun laws and enforce the laws we have. This has been consistently shown in national and state polling for many years now. Even gun owners want reasonable gun laws. So what are we waiting for? We are waiting for our leaders to get out from under the thumb of what was once a more powerful gun lobby. They are not your father’s or grandfather’s gun safety organizations any more. They are in existence to protect their own perceived power and the profits of the gun industry it represents. The gun lobby doesn’t want us to know how easy it is for prohibited people to get access to guns. 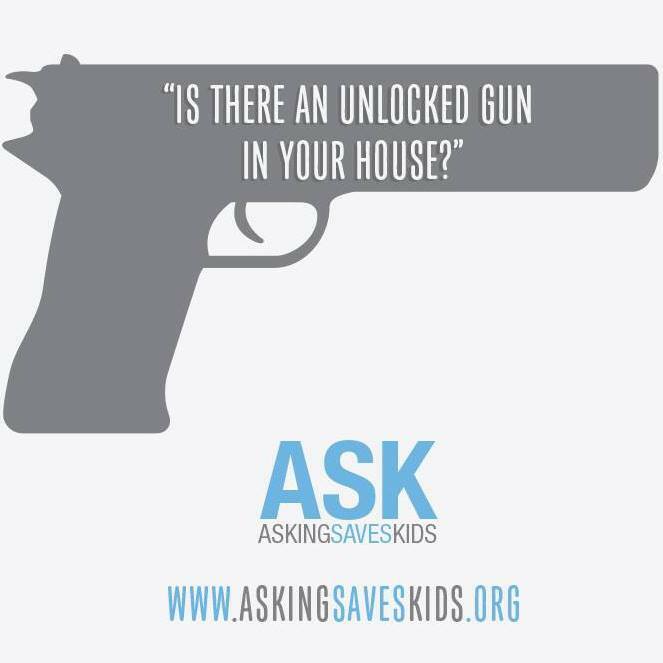 They don’t want us to know how easy it is for kids and teens to access the guns that are used in “accidental” shootings and suicides. 80% of gun deaths in Minnesota are due to suicide. In states that have required background checks on all gun sales, suicides have decreased as have domestic shootings. 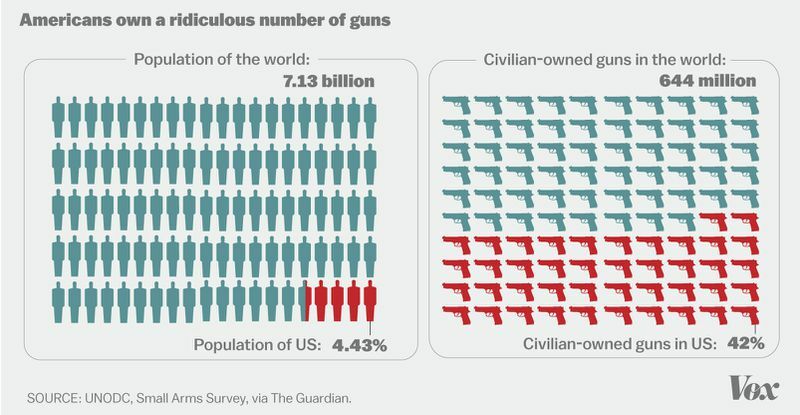 The proof is in the numbers and the inconvenient truth. They don’t want us to know that American service members are shooting themselves on a regular basis. They don’t want us to talk about how easy it is to get a gun on internet sites. They don’t want us to know about the 89 Americans who die every day from gunshot injuries. This is an inconvenient truth. But the public is way ahead of their leaders. It’s time for our leaders to catch up to reality and stop being afraid of the bully in the room. It’s time for us all to raise our collective voices and demand that something be done. That time is coming in Minnesota and all over our country where the majority has had #Enough. Armed white men, or insurrectionists or …. “A well regulated Militia, being necessary to the security of a free State, the right of the people to keep and bear Arms, shall not be infringed.” So in our country we do have a “well regulated militia” in the form of our standing military and national guard. What gives people the idea that they need to perform that role ala the second amendment? “These men came to Harney County claiming to be part of militia groups supporting local ranchers, when in reality these men had alternative motives to attempt to over throw the county and federal government in hopes to spark a movement across the United States,” Ward said. People in Burns are used to worrying about friction between the federal government and locals, but takeover is raising concerns to a new high. And the only “tyranny” here is a bunch of armed now-felons terrorizing the local community. But, hey, there is a long history of militia members and groups committing crimes and plots, including murder, insurrection, and even genocidal schemes. So it’s not like this is totally unexpected. In most countries, “citizen militias” would be outlawed for what they are: homegrown terrorist organizations. This is just the latest and, perhaps, most flagrant of examples. This occupation follows a peaceful parade by around 100 anti-government sympathizers earlier in the day in Burns, Oregon, organized by a small-time right-wing talk show host. They met in a Safeway parking lot to do speeches, then marched a mile to the home of one of the convicted ranchers they support, and then drove to the local Sheriff’s office to throw pennies at the building for some reason (which were quickly snatched up by a couple of girls), before returning to the Safeway parking lot. But pro-gun bullieshate peaceful protests. Successful peaceful protests run counter to their flawed argument that guns are needed to enact change. (…) I can’t imagine a more pitiful example of a “revolution” than this. Not only do the Hammonds and the community not want the militia there, but the crime is taking place in one of the most remote and sparsely-populated areas of Oregon, at a time of year when no one goes there, and in a month when the temperatures are at the lowest. At the time I’m writing this, it is -1 degrees Fahrenheit. Good luck staying warm, felons, particularly after your electricity is cut and any fuel for your generators (if you have any) runs out. It’ll be interesting to see how law enforcement and the government respond to this situation in the coming days. The insurrectionists and Bundy family are clearly wanting a shoot-out to occur, a la Ruby Ridge, making them some sort of “martyr” to their extremist cause. But I’m guessing that, if they don’t fire first, they are more likely to be surrounded in a siege until they either give up or they freeze to death. Assuming they survive, it is comforting to know that their new felon status will prevent them from legally purchasing or possessing firearms. So what we have here is anti-government sentiment expressed with firearms. That is quite different from, for example, protests by Black Lives Matter groups to work towards racial justice and calling attention to law enforcement shootings of young black people. Thrse are unarmed people protesting and yes, there has been, unfortunately, looting and property damage when it gets out of control. But there have also been armed white folks taking matters into their own hands as in what happened in Minneapolis last month. Anti-government sentiments are being fomented by none other than Presidential candidate Donald Trump and other (mostly) Republican candidates. The corporate gun lobby also spews out fear and paranoia of gun confiscation and government take-over of rights and guns if any reasonable gun safety reform laws are passed. We are seeing the results of the fear, paranoia, and hatred acted out in small towns and large urban areas all over America. When it comes to the gun culture in our country, we are seeing what has been predicted by the gun rights extremists and the right wing extremists. Fighting against government policies should not come at the end of a barrel. Using the threat of violence is not patriotic or the American way. We change things through discussions, lobbying, getting involved, voting, organizing and having some common sense. If we are going to start using guns and the threat of guns to change the government, the leaders and/or the policies, we are not a democracy any more. This is ludicrous. And it points to the dangers that come with fear mongering. We have better things to do in this country like trying to keep our children and communities safe from gun violence. Let’s get to work on that and put away the guns.